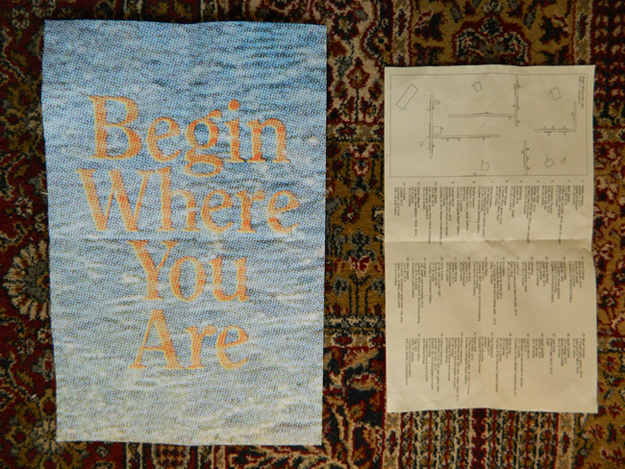 Begin Where You Are offers a unique view of Philadelphia’s art community. It begins with an understanding of the city’s particular art culture and explores this with the attention of a cartographer. 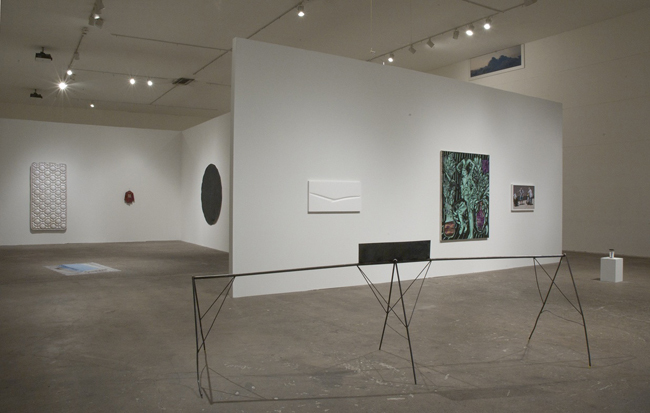 The space for the exhibition was customized for the display of the particular works shown, and it maps the conversation that came to life for the curators as they researched the works and the artists. The installation layout within the Icebox Project Space simulates a large house with an inverted row home-like design: there is a hall in the center and rooms on either side. Upon entering the exhibition, the viewer is offered a guide to the space that includes a visual floor plan and a numbered key with information about the works. 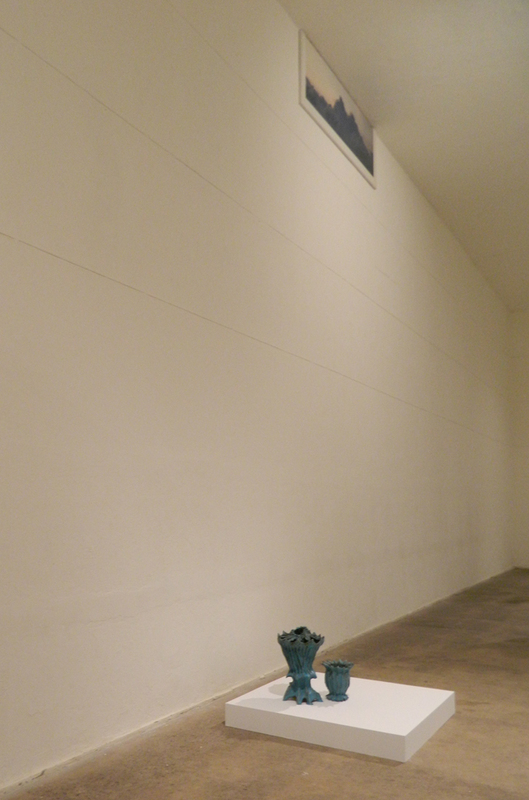 No labels are installed anywhere in the gallery space. The sectioning off of rooms speaks to Philadelphia’s neighborhood culture, with interspersed geographic sections of the city having their own feeling, aesthetic, ethnicity, and patterns of movement, like a giant patchwork quilt. 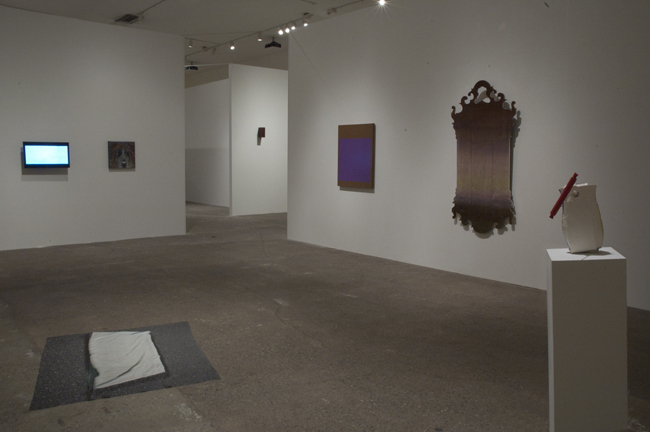 Curators Ryan McCartney, Timothy Belknap, and Anna Neighbor are all artists working and living in Philadelphia. They know that the city is a place without filters, and where there are few divisions between different kinds of people. The boundaries between neighborhoods are blurred and always changing. This has an especially interesting effect on the art community in the city. Take Karyn Olivier and her sculpture, Danger Sign, a stripped road sign left with only its skeletal structure and small notes of bright yellow paint on its industrial metal feet, sitting at the entryway to the exhibition. In an interview about her sculptural works, Olivier says, “over time, the physical weight of the object is often eclipsed by the psychological weight of the piece. A viewer has a heightened awareness of himself and his present-ness in the situation” (Olivier, July 2012). Olivier’s understanding of art permeating life gives the viewer an acute sense of physicality when experiencing her sculptures, and the spaces around them, allowing Begin Where You Are to indeed begin in the psychological and physical present for the viewer. Near Danger Sign is Across by Isobel Sollenberg and John Gibbons (who collaborate under the name Dechemia), a pristine white, squared plaster surface with one poignant sculptural bend. The play of crippled movement resonated with Danger Sign, creating a feeling of sad determination. The work is solid yet crushed, beautiful yet injured. In the next room, the wall-mounted Twin Mattress by Daniel Petraitis, creates a kind of artifact display. This work echoes the simple gestures and humble materials of Danger Sign and Across, and offers a powerful emotive quality that speaks to the resourcefulness of the artist, and of the city-dweller. The works evoke movement, like the placing and rearranging of one’s belongings. There is anxiety in making a place, and a home for oneself, doubled by the predicament of being an artist trying to make a living anywhere. 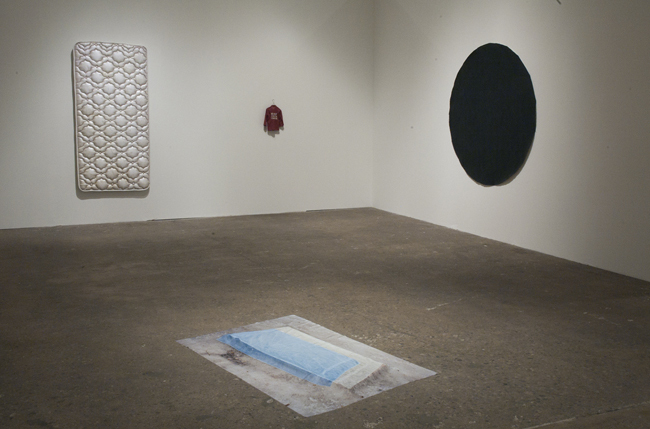 Micah Danges’s 2 Towels (blue green) is in a mundanely humble position on the floor, a photograph in sculptural relief showing two superimposed images of towels, laid on an outdoor surface almost identical to the cement floor of the exhibition space. The image is understated, but not quite at harmony with its surroundings. The work feels like a makeshift resting place, an impromptu bed. The towels in the image are translucent, giving a sense of profound loneliness—the impermanence of place and home. None of the curators of Begin Where You Are are originally from Philadelphia. Perhaps they also asked themselves what this place means to them and how it is different to experience home in a place of one’s own choosing rather than a birthplace. They created a veritable cross-section of Philadelphia artists from the perspective of settler, not native. This also offers objectivity to the curatorial choice that may not have otherwise been possible. Like mischievous scientists, the curators chose several samples from different places, mixing them with other samples, looking for a reaction that might create a spark. Categorically disparate works like Shelley Spector’s Common and Quentin Morris’s January-February, 2014 may not normally be hung next to each other. Fortunately, this exhibition is a good place for experimentation. This vitality is key to the art world of Philadelphia. There is concern for the work, for making, and for doing—rather than categorizing. There is a freedom from the pigeon-holed view that sometimes occurs when success dooms artists to adhere to a type. Painters take lessons from photographers and video artists take lessons from abstract paintings. This results in a strong attention to texture and physicality, no matter the medium. Materiality is at the heart of emotion and connection in Begin Where You Are. Looking down into Paul Swenbeck’s bright teal ceramic urns is like looking into an endless void. The dripping of the glaze and the modeling of the inner walls descend into a collection of stalactites, obstructing a clear view of the bottom and rewarding the meandering eye. As these sculptures point down to the ground, Eileen Neff’s nearby photograph, Twin Peaks, points upward. The work is missing the top of its frame, making the piece appear to be cut off by the ceiling. In this way, the exhibition creates movement, not only between the physical positions of work in the gallery space, but also through the viewer’s mind and across his or her imagination. 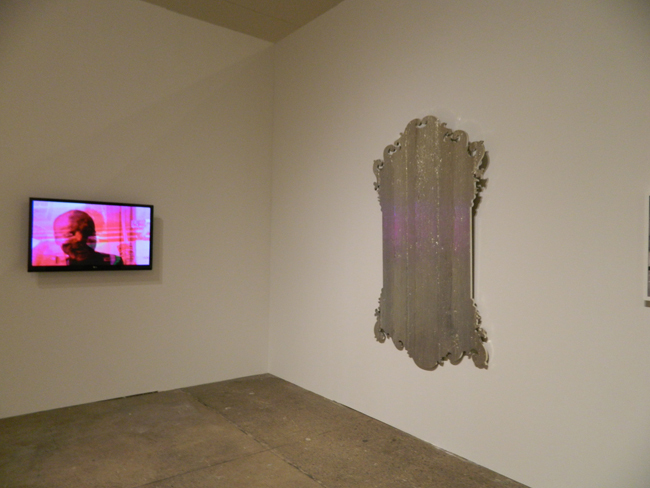 Virgil Marti’s Life, Death, and Immortality, a chrome-plated surface in the shape of a large antique mirror is positioned so that in the next room, his Vesper—a similar, partner work—sits directly on the other side of the wall. 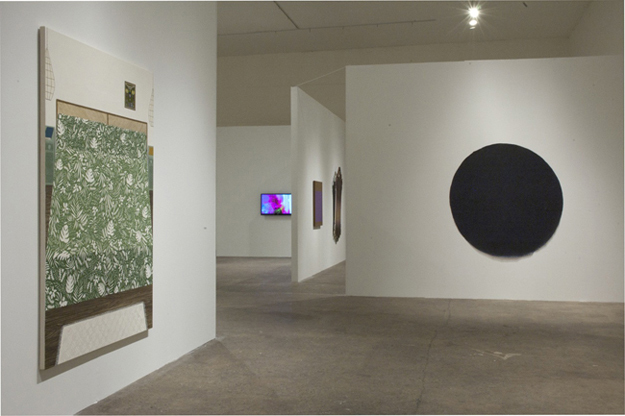 The arrangement of the two works entices the viewer’s imagination to pass between the mirrors and the wall. The freedom to experiment, veering between different media and celebrating the handmade so joyously, is certainly accompanied by a great deal of faith. Marc Zajack’s I.E.D. sculptures give an impression of clumsiness in their initial appearance; but they soon loom ominously with their sinister hum prevailing audibly down the barren corridor of the exhibition. The unsophisticated aesthetic of the works gives an ironic endearing quality to something named for a type of bomb. In this way, faith wins out over anxiety in the end. The exhibition plays between cynicism and possibility, disorientation and belonging. The works reveal themselves in their relationships to each other. The combination of art from artists of varying experience, age, race, and material success brings out unforeseen new meanings in each work. I have found, in my experience of moving to Philadelphia from Washington D.C., choosing it above New York for graduate school, that there is a special kind of intentionality in the art made here. Many native artists stay in Philadelphia even after they become famous, or they move here to pursue art as a newly emergent professional. For a visual artist and a “foreigner” it is not the most obvious choice. There is genuineness and a steadfast work ethic that vibrates in Philadelphia and creates a unique flow of energy. Artists are not as fretful about trends in the art market, at the fairs in New York or London, or in biennials. Instead, they focus on having a keen awareness of their own surroundings and the implications of making art in this time and in this city. There is, as Neighbor remarks, “a deep and exciting earnestness. A vital wrestling in the work with what it means to be human, to be an artist, to be here doing it.” This is why artists come to Philadelphia and why they have stayed here. It may not always be trendy, but it is always where we are. Jenna Buckingham is an artist living in Philadelphia. She recently graduated with an MFA from Pennsylvania Academy of the Fine Arts.